Happy October 15th! Yes, tax season is over! At least for now. Sorry for being awol for quite a while. Yep, these were taken when I was at the office. I didn't have time to put my makeup on before work. I was rushing to beat the morning traffic. I don't usually wear makeup when I go to work just because I don't really have time and I don't feel like it especially during busier months like now. 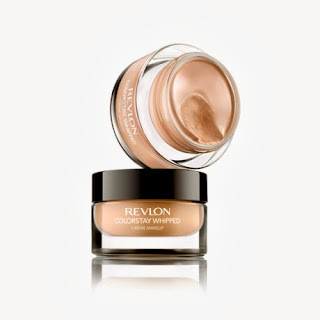 This was on a Friday, so I thought I post a review on an old product I've been using but haven't got a chance to put on a test till now, Revlon Whipped Foundation. My shade is warm beige. What a difference makeup makes! Look at my chubby cheeks on the before shot. You can see from comparing the two pictures, the finish of this foundation is quite matte. Yes, it perfects your skin, but that's exactly why I don't like to use this often. It doesn't really look as natural as I prefer. The consistency is very thick. I remember seeing this the first time and thought "It does look whipped." I don't really feel the need to use concealer when I use it. As you might have guessed from the thick consistency, it also does show on the coverage. You might want to be careful when applying the product because a little bit does go a loooonngg way especially for a product as thick as this. I dab a few dots on my face and blend it with my Sigma kabuki brush. I then dab a bit more on blemishes to act as concealer. As far as the coverage goes, the foundation pretty much still covered my blemishes, although I could see it oxidized a little bit. I could still see my blush which is a good thing, but the finish is not as matte as I first applied it in the morning. From the picture, you can see that it slightly turns to a dewy finish. And no, it's no a good dewy look I like. Under natural lighting, the foundation still looks pretty good, although as I said, it's lost its "perfect" coverage. Lo and behold! You don't want to take flash photographs with this foundation after several hours. Look how oily my face is! I can literally wipe off excess oil from my forehead, nose and cheeks and it rarely happens for me as my skin is more on the dryer side, but then again, it might have changed towards combination after all the products I've used. Overall, it is a good foundation, but it's not something that I would go for a day-to-day use. I also wouldn't rely on it as a long-lasting product as it, ehm, oils my skin. This does look good for photographs on the first few hours. It needs touchups and all that jazz to make it last longer.